BT300CP is a lead-free-capable batch reflow oven that takes up little more than 27" x 22" of table space. Electronics assemblers who need to produce prototypes, pre-production boards and other small batch/short-run jobs in-house can now get inline reflow results in a small footprint, at an affordable price-now with full computer control. Manncorp’s BT300CP batch reflow oven has been upgraded to full computer control and now includes a laptop computer for convenient programming and program retrieval, oven operation, real-time display of actual board or oven temperatures, and process data storage and printing. 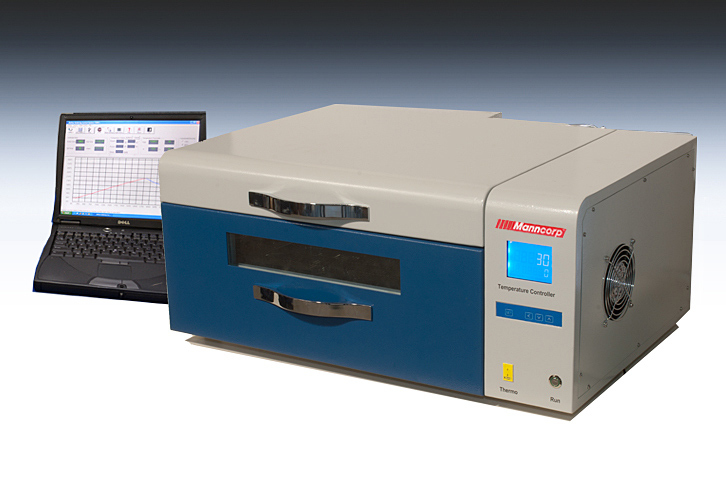 This benchtop reflow oven's ability to set as many as 40 sequential temperature points allows the temperature curves of solder paste manufacturer recommendations to be accurately reproduced, much the way an inline oven would. This not only produces production-level results but also simplifies the transition from prototyping/small batch production to full production. BT300CP is a lead-free-capable batch reflow oven that takes up little more than 27" x 22" of table space. It ships directly from San Diego, California, comes with a 2-year parts warranty, and full software support is provided by Manncorp techs in the USA. The BT300 series is also available as a nitrogen-ready oven (model BT300NCP). Learn more and access pricing on the BT300CP, or contact sales@manncorp.com to discuss your unique reflow requirements.